Greek and Roman mythology has fascinated people for thousands of years, and its influence on cultures throughout Europe, America, North Africa, the Middle East, and elsewhere attests to the universal appeal of its stories. Encyclopedia of Greek and Roman Mythology examines the best-known figures of Greek and Roman mythology together with the great works of classical literature that are the sources for our mythological understanding. In 365 A-to-Z entries, this encyclopedia presents ancient mythology from a literary perspective and features numerous illustrations from both ancient and modern works of fine art to show how myths have been transmitted in visual form through the ages. 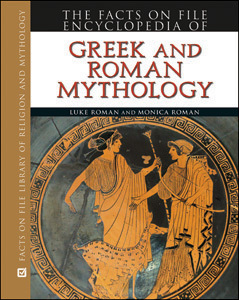 "...a beneficial resource for anyone wanting to explore the original classical sources of Greek and Roman mythology. Recommended." "...useful...recommended for public libraries, especially those with mythology collections or that serve college students, and for college libraries..."
"...a worthy addition to collections."